Bink & Gollie and Bink & Gollie: Two for One by Kate DiCamillo and Alison McGhee, illustrated by Tony Fucile. Grades 2-5. Candlewick Press, 2010 & 2012 (respectively). 81 & 96 pages (respectively). Review copies provided by my local library. Am I the last person to read the Bink & Gollie books? I very well may be, but in case I'm not: don't let Bink-and-Gollie-absence syndrome happen to you! Bink is short. Gollie is tall. Bink is a little reckless. Gollie is quite practical. Bink loves brightly colored striped socks. Gollie thinks brightly colored striped socks are tacky. They're opposites in a lot of ways, but you know what? Bink & Gollie both love to roller skate. And they both love having adventures. Together. I had a patron the other day who just might have loved Bink & Gollie. This particular patron was starting to read chapter books, but still much preferred books with lots of pictures. He devoured the books in our graphic novels section, but was also ready for a little bit of a challenge. Bink & Gollie with its somewhat sophisticated vocabulary and plethora of humorous illustrations would have fit the bill perfectly. These are very sweet, funny stories about two friends who like to do everything together. From roller skating to buying pets to eating pancakes to visiting the carnival, Bink & Gollie are inseparable (even when climbing mountains). Their friendship reminded me of my beloved Frog & Toad and I think this series would be a great readalike for those books. They're a bit longer, but many pages are filled with funny, expressive illustrations, limiting the text on each page. For this reason, I would hand these books to reluctant readers, as well. The vocabulary may be more suited to kids who are reading well, while the format may entice kids who aren't yet sure that they like to read. Bink & Gollie's ages are never explicitly stated and, really, they could be any age. Although the text is short, these are funny stories that will appeal to a wide range of readers. 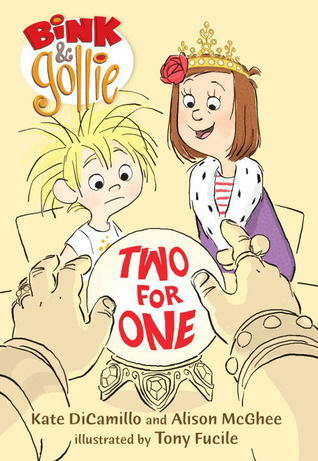 Bink & Gollie and Bink & Gollie: Two for One are on shelves now! 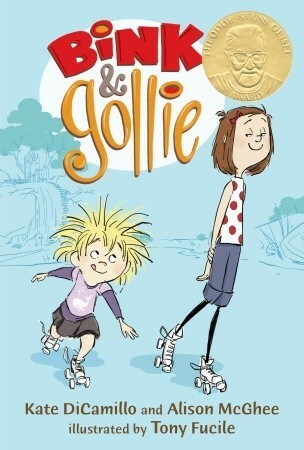 Also look for the recently released Bink & Gollie: Best Friends Forever. Matilda 25th Anniversary Blog Tour!!! Emerging Readers: Start With a Book (Blog Tour)! 2015 Newbery Committee, Here I Come!